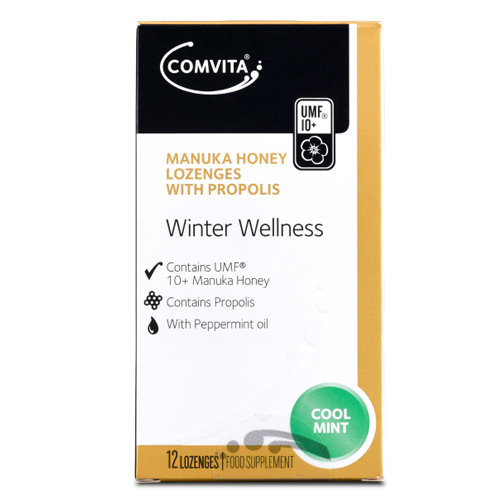 Comvita Manuka Honey Cool Mint Lozenges may help support and maintain a healthy immune system along with maintaining the health of the mouth and throat. Honey has long been recommended for supporting and maintaining a healthy mouth and throat. Manuka honey, which forms the base for this great-tasting product, has exceptional properties in this regard. Propolis and UMF Manuka honey combine effectively with other essential oils in a herbal base, to produce a pleasant tasting throat-warming formula. Comvita Lozenges are family favourites available in four great tasting varieties: Lemon & Honey, Cool Mint, Menthol and Original (Aniseed). The lozenges combine the power of propolis with the effects of UMF Active Manuka Honey. Sugar, Corn Sugar, UMF 10+ Manuka Honey (212mg per lozenge,4.7%), Water, Propolis Solids 110mg (22mg per Lozenge), Menthol, Peppermint Oil 76mg (15.2mg per lozenge), Humectant (magnesium silicate). Dissolve one lozenge slowly in the mouth. Repeat, as required, up to five lozenges daily. Warning: Propolis may cause severe allergic reactions in allergy sufferers. If swelling occurs of the mouth or throat, discontinue use. Do not use where there is a known allergy to honey. Allergy to bee stings does not prevent the use of this product. Below are reviews of Comvita Manuka Honey - Cool Mint - 12 Lozenges by bodykind customers. If you have tried this product we'd love to hear what you think so please leave a review.